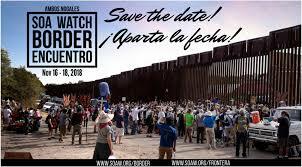 Time is flying and in less than 2 months we will converge at the US/Mexico border in ambos Nogales for our 3rd SOA Watch Border Encuentro this November 16-18: Dismantle Border Imperialism! Struggle, Create, Power to the People! As we continue planning for this year's 3rd Encuentro, we want to share important updates with you, including our promotional video created by Olmeca, the weekend schedule of events and ways to support our largest annual gathering. 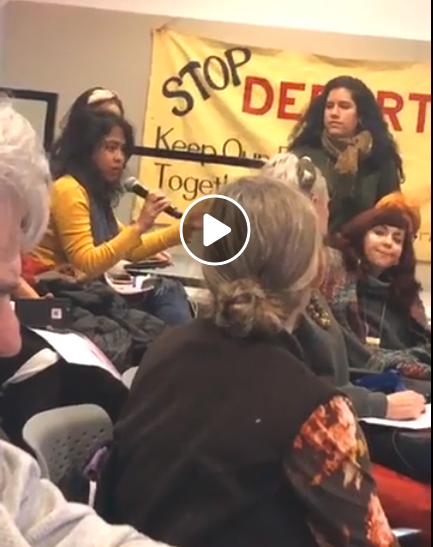 We are excited to share our demands for this year, and invite you to join us in generating the biggest possible impact alongside other coalition groups and allies by endorsing this year's Encuentro. 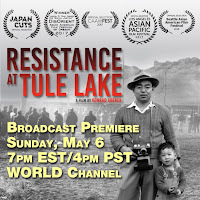 "Resistance at Tule Lake" is Now Available on DVD & iTunes! over 20 cities across the country since its premiere at CAAMFest 2017. 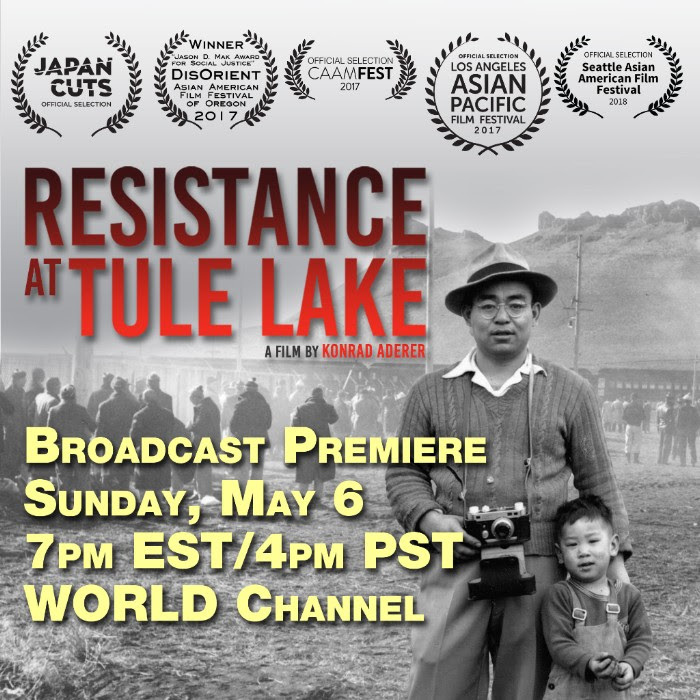 The maker are still getting requests for more ways people can see Resistan.ce at Tule Lake. The film is now available on DVD and iTunes! Demand for the film has been so high on the Netflix queue that they also jumped on board and are now offering the film for disc rental. Most people are capable of holding two or more conflicting ideas on any given issue. Immigration is no exception. 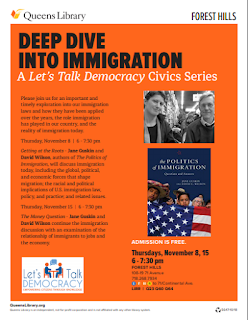 Book Excerpt: Is Birthright Citizenship a “Magnet” for Unauthorized Immigration? 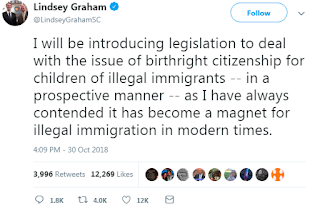 On October 30 Senator Lindsey Graham (R-SC) announced that he would introduce legislation to challenge birthright citizenship for the U.S.-born children of undocumented immigrants. “[I]t has become a magnet for illegal immigration in modern times,” the senator claimed. 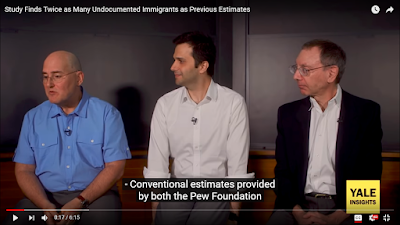 Many immigration opponents have asserted this, but they’re rarely challenged to provide proof. Children born in the United States are U.S. citizens, even if their parents are out-of-status immigrants. Opponents of immigration like to call such children “anchor babies,” implying that immigrant parents use their U.S.-born children as a way to establish themselves here. 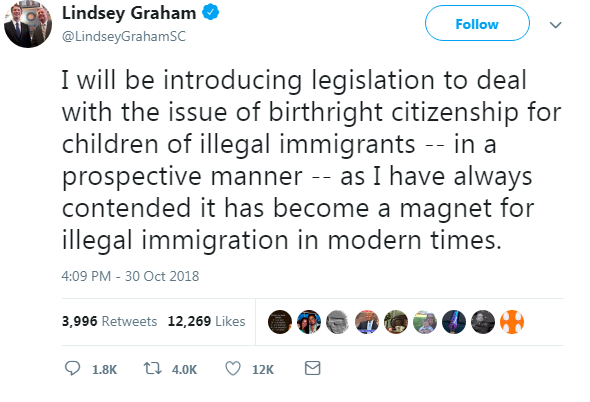 In July 2010 Senator Lindsey Graham (R-SC) claimed on Fox News that unauthorized women come to the United States simply to “drop and leave” their babies. Most citizen children of undocumented immigrants are actually born some time after their parents have settled in the United States, according to a study of babies born to immigrants from March 2009 to March 2010. 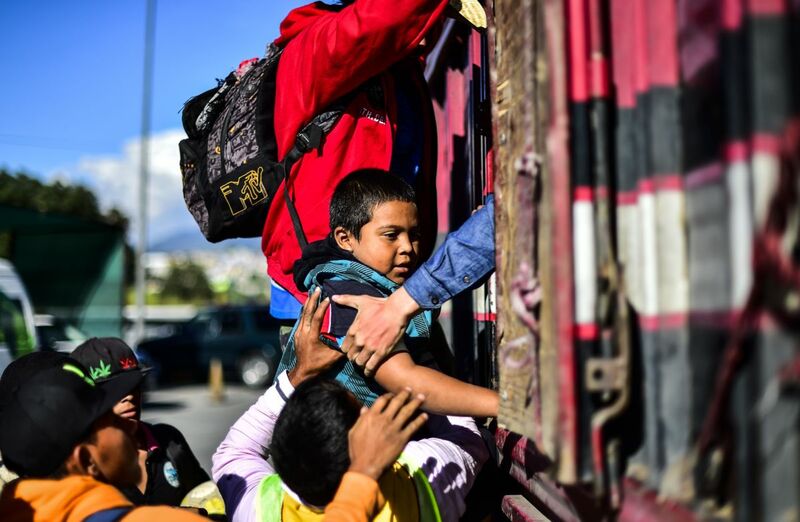 Just 9 percent of the out-of-status parents had arrived in 2008 or later; most had been in the United States for a number of years when the babies were born—30 percent had arrived between 2004 and 2007, and 61 percent arrived before 2004. For its October 2005 survey, Bendixen & Associates asked undocumented immigrants to give their reasons for migrating to the United States. The respondents overwhelmingly cited work opportunities; having “anchor babies” didn’t even rate a mention. In any case, having a U.S. citizen child doesn’t help undocumented immigrants gain legal status, or even protect them from deportation. U.S. citizens have to be at least twenty-one years old to sponsor their parents for legal residency. Each year, thousands of people who have U.S.-born children are deported, leaving families shattered. 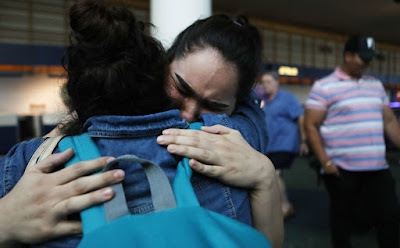 A 2012 study by the New York University School of Law’s Immigrant Rights Clinic found that 87 percent of New York City immigration cases involving parents of U.S. citizen children between 2005 and 2010 ended in deportation…. If we ended birthright citizenship, what status would the U.S.-born children of undocumented immigrants have? Would they also be undocumented? In that case, ending birthright citizenship would increase the number of undocumented people in the country; the undocumented population would be at least 44 percent larger by 2050, according to a projection by the nonprofit Migration Policy Institute project. In other words, revoking the country’s long tradition of granting citizenship to everyone born here would expand and make permanent an underclass of vulnerable, easily exploited people without full rights—very much like the U.S. South under Jim Crow laws or South Africa under apartheid. Two of the immigrant rights movement’s historic demands provide a basis for actually closing the agency, and beyond that for building a movement to demand more fundamental changes. 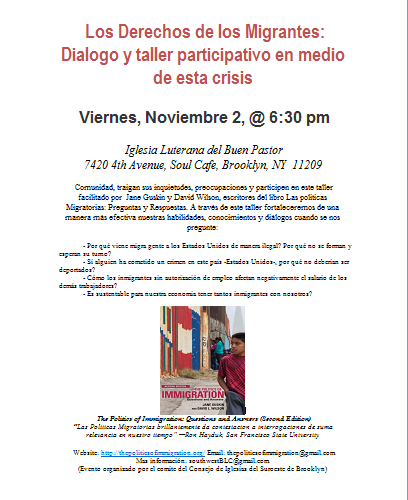 Join Families for Freedom for a participatory dialogue around immigration enforcement, detention and deportation with Jane Guskin and David Wilson, authors of The Politics of Immigration: Questions and Answers. 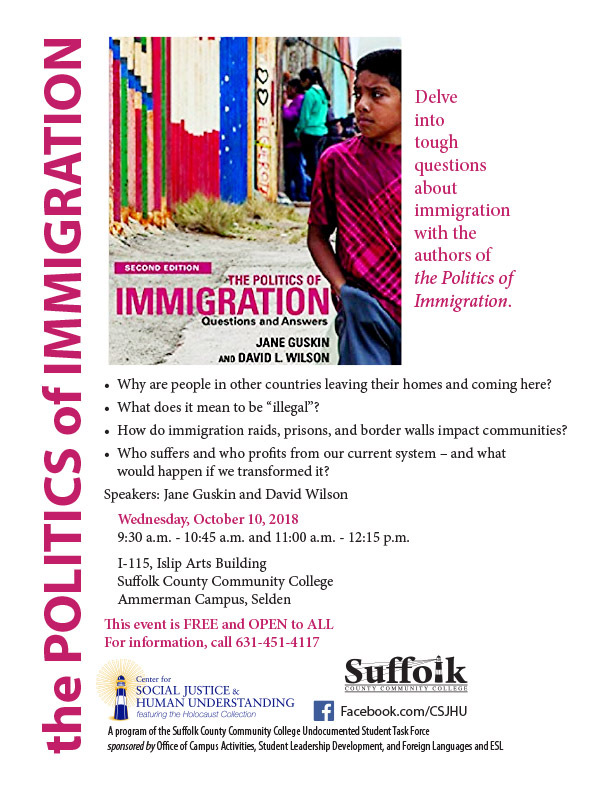 We will discuss the state of immigration—with a focus on enforcement, detention, and the relationship between the immigration and criminal legal systems—in our current political environment. This is an excerpt from the Families For Freedom newsletter for September, treating the important issue of activist approaches to local ICE detention contracts. To subscribe, email info@familiesforfreedom.org; you can contribute to FFF here. )—TPOI editor. In early September, Hudson County announced their intent to phase out their detention contract with ICE by 2020. The news came after concerted efforts by local faith-based and advocacy groups to end the contract, and a lawsuit filed by the ACLU that targeted the Freeholders' shady actions in trying to get the contract renewed without community input. The potential cancellation of ICE's contract in Hudson represents political strength: it would not be possible without growing support in our movement against immigration detention, if ICE's name did not now correctly represent malice and evil to the general public. 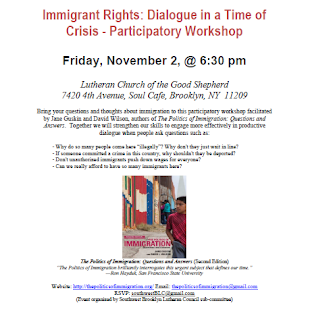 Yet at the same time, it counteracts another win that also represented political strength, the establishment of the New York Immigrant Family Unity Project. On the one hand, the win of access to indispensable legal representation; on the other, the win of building political power among allies outside. 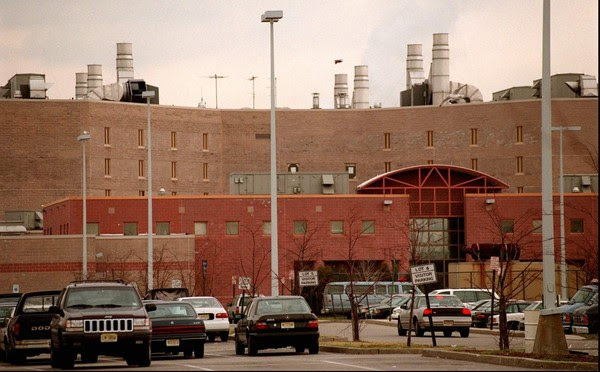 Critics of the phase-out are concerned that people detained in Hudson will be moved to remote detention centers, far from their families and attorneys. NYIFUP lawyers have come out in strong opposition to the planned phase-out on these grounds. 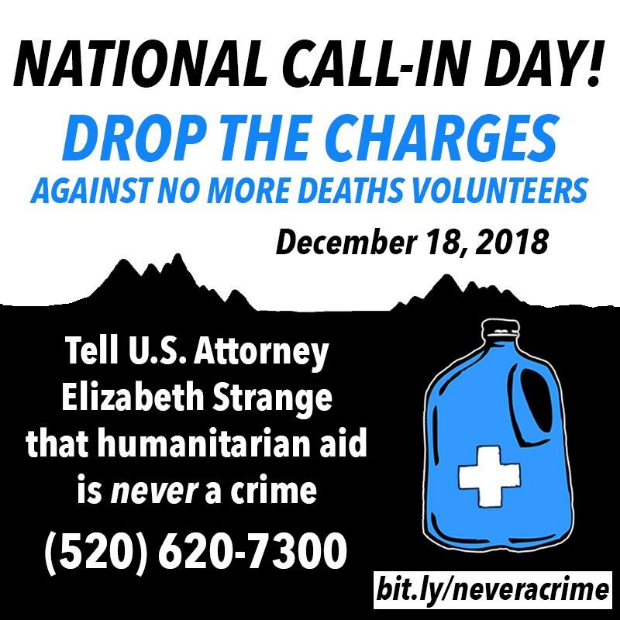 In support of their position stand previous incidents, like when trans women incarcerated by ICE in Santa Ana City Jail, close to a dense network of support and services groups, were moved far away to a remote facility in rural New Mexico. Supporters of the Hudson contract ending—and of the growing number of other similar successes around the country—are behind it because of the political momentum it both creates and represents. Beyond these two positions, there is also the question of efficacy. 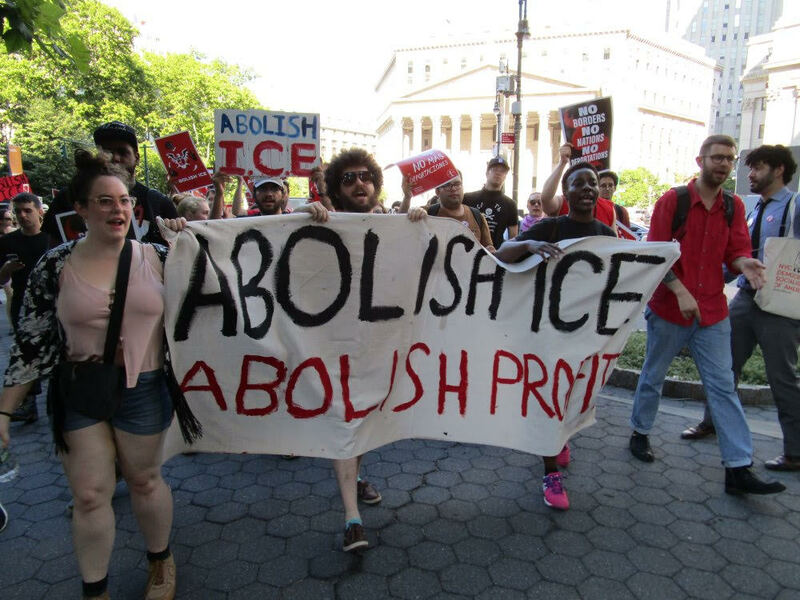 One of the organizations involved in the campaign against the Hudson contract stated that in order to abolish ICE "we must destroy ICE's capacity to incarcerate people." The statement is noble but the problem with it lies in the fact that this political win does not affect ICE's ability to incarcerate people. Anything that we can do to hinder ICE—to make 'em bleed—is absolutely worth doing, but we must understand that contracts with local jails and private prison companies come and go, whether in scandal or in silence. Back in 2009-10, after people detained in Varick Street in Manhattan went on hunger strikes to draw attention to horrific conditions there, the jail stopped incarcerating people, many of whom would not be jailed in Hudson. But this decision was made by ICE, and its purpose was to get away from local scrutiny. More recently, in the wake of an 18-month-old baby being killed by her contact with the detention and deportation system, the City of Eloy pulled their contract with ICE for a family detention in South Texas. This too was a decision supported by ICE, and the contract has now been redrawn, this time with the city of Dilley, TX. Across the country, more counties and cities are folding detention contracts with ICE, both under public pressure and without it. But as long as ending such contracts doesn't get people free, we have to ask ourselves what value these closures have. In contrast to ending contracts that promote information sharing between local law enforcement and ICE, or legislation barring ICE from certain areas, cancelling detention contracts more than likely just means relocating jails. Abolition doesn't mean the transporting of incarcerated people from county to county, nor the opportunity for new profit to be spun from immiseration; it means no more people locked up. What value do these campaigns have if the results resemble ICE's own past actions, and fail to promote political power among those incarcerated in these facilities? To that point, it is noteworthy that in the debate that has unfolded about whether this closure is of value, the voices of the directly affected have been relatively absent. Lawyers in movement are often correctly criticized for failing to see the forest for the trees, for working timidly within what's presently possible instead of pushing the boundaries of what is possible. But the concerns and criticisms raised by the lawyers here need not lead to a purely reformist attitude, focused only on procedural justice instead of actual justice. 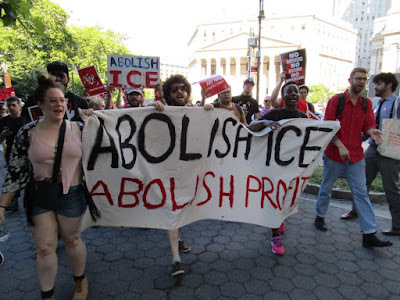 The concerns invite us who believe in abolishing ICE and the entire prison industrial complex to continue asking the question: how can we be effective? How do we ensure our fights are changing the conditions people suffer under, and not providing an outlet for the moral outrage of spectators? How do we fight to win? Please join us for an important and timely exploration into our immigration laws and how they have been applied over the years, the role immigration has played in our country, and the reality of immigration today. 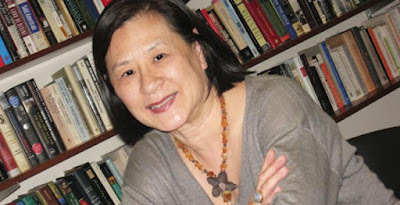 E F M R to 71/Continental Ave.
Mae Ngai, a national authority on the history of immigration and professor at Columbia University, will kick off our three-week series on immigration. 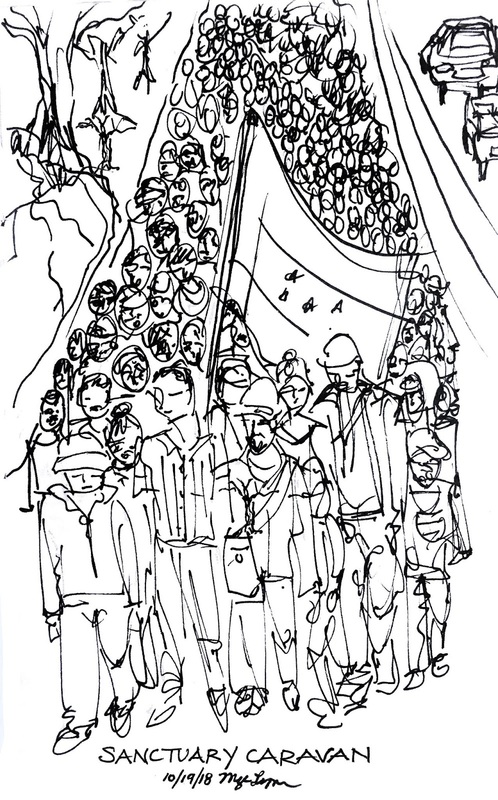 · Why do so many people come here “illegally”? Why don't they just wait in line? · If someone committed a crime in this country, why shouldn't they be deported? 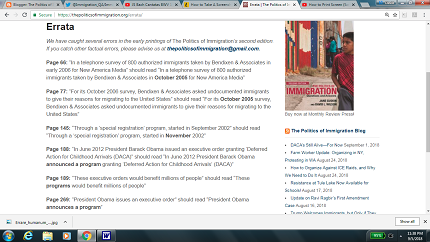 · Don't unauthorized immigrants push down wages for everyone? · Can we really afford to have so many immigrants here? Por qué viene migra gente a los Estados Unidos de manera ilegal? Por qué no se forman y esperan su turno? Sí alguien ha cometido un crimen en este país -Estados Unidos-, por qué no deberían ser deportados? Cómo los inmigrantes sin autorización de empleo afectan negativamente el salario de los demás trabajadores? Es sustentable para nuestra economia tener tantos inmigrantes con nosotros? 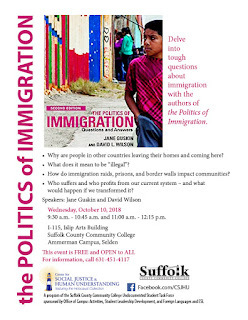 Getting at the Roots - Jane Guskin and David Wilson, authors of The Politics of Immigration, will discuss immigration today, including the global, political, and economic forces that shape migration; the racial and political implications of U.S. immigration law, policy, and practice; and related issues. The Money Question - Jane Guskin and David Wilson continue the immigration discussion with an examination of the relationship of immigrants to jobs and the economy. In a September 30 article, the Washington Post’s Nick Miroff (@NickMiroff) covers a visit to Central America by U.S. Customs and Border Protection (CBP) head Kevin McAleenan. 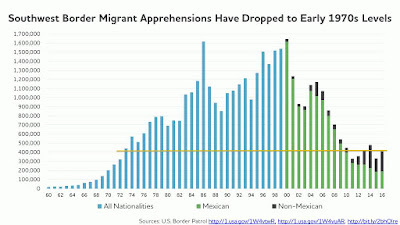 Miroff reports that border apprehensions of migrant families along the southwest border increased by 38 percent in August over the month before; he also notes that the number of Guatemalan families apprehended in fiscal 2018 is nearly double the number from the previous fiscal year. Miroff is an excellent reporter who has broken a number of stories, notably on the child separation policy. But in common with most of the corporate media, his reporting often lacks context. “Trump erupted earlier this year when border arrests skyrocketed,” he writes. 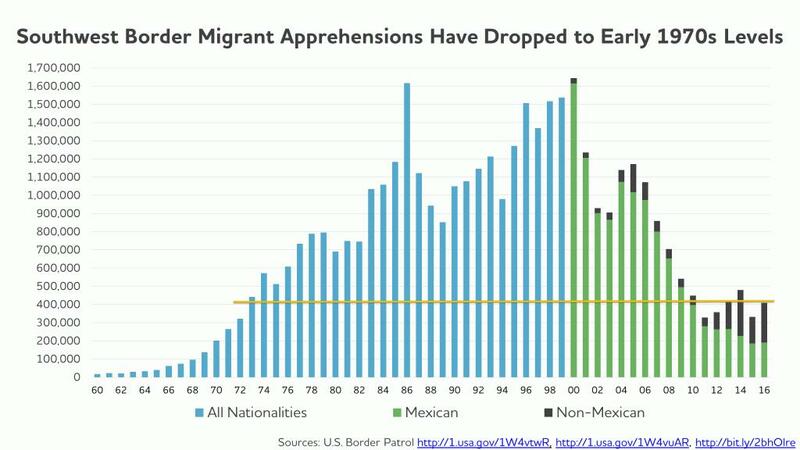 It’s true that there was a major increase in asylum seeker arrests, but terms like “skyrocketed” reinforce the impression that alien hordes are pouring across the border. The rise in these arrests actually turns out to be a blip if we view it historically. 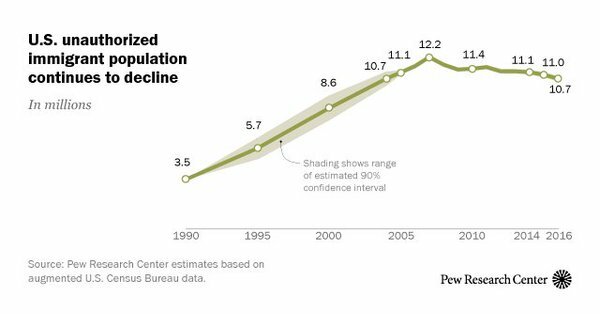 Even with the new arrests, border apprehensions remain—and have remained for a decade—at their lowest level since before the majority of the current U.S. population was born. The article also discusses push factors in Central America’s Northern Triangle, and warns that “[n]ew instability and political polarization in Guatemala could make things worse in the coming year” because of actions by corruption-prone President Jimmy Morales. “American officials have been hesitant to criticize Morales,” Miroff writes. He doesn’t mention that “American officials” have in fact backed every corrupt regime in Guatemala at least since a CIA-backed coup in 1954.
operated by the family of California Congress member Devin Nunes, a major Trump supporter. The family quietly moved most of its California dairy operations to this farm, located in the small town of Sibley, more than a decade ago. Lizza wondered why they had been so careful to avoid publicity about the move, so he went to Sibley to investigate. His investigation quickly turned into something out of the old hardboiled detective genre, with sources suddenly clamming up and mysterious vehicles tailing Lizza as he drove around town. Eventually the mystery was solved: dairy farmers and others in the area seemed to be heavily dependent on undocumented labor to carry out their operations. 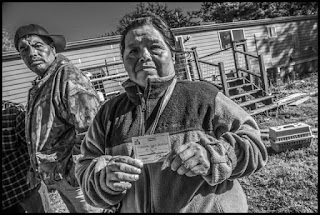 Lizza was unable to establish anything about the Nunes family’s farm, but the presumption is that they too relied on unauthorized workers. Rep. Nunes himself appears to be a moderate on immigration issues, but he’s been an important enabler of the Trump regime, which is committed to a ferocious anti-immigrant agenda. Sibley farmers seem to maintain a similar duality: they disagree with Trump and their Congress member, white supremacist Steve King, about immigration policy, yet they vote overwhelmingly for these men. “There is massive political hypocrisy at the center of this: Trump’s and King’s rural-farm supporters embrace anti-immigrant politicians while employing undocumented immigrants,” Lizza writes. Lizza’s reporting is great, but his analysis isn’t especially deep. 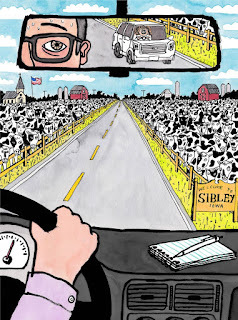 He notes that Iowa’s dairy farmers use undocumented labor to save money—“workers start at fourteen or fifteen dollars an hour, the first farmer said. If dairies had to use legal labor, they would likely have to raise that to eighteen or twenty dollars”—but he doesn’t explore how “illegality” forces these workers to accept lower wages. And he fails to ask who ultimately benefits from the exploitation of undocumented farm workers. It’s actually not the farmers, Lizza notes: “many dairies wouldn’t survive” if they had to pay authorized workers. In other words, the farmers underpay their workforce because they are being squeezed by the large food processing and distribution corporations, which pocket the extra profits. So an obvious question would be whether these corporations or their CEOs make contributions to anti-immigrant politicians like Trump and King. Unfortunately, Lizza doesn’t raise this. He also seems uninformed about guest worker programs. As Iowa’s farmers see it, the best option is bringing in H-2A workers; farmers can exploit these laborers just as easily as the current undocumented force but without the risk of fines or jail sentences for violating immigration law. However, dairy farming requires year-round employees, while the current H-2A programs only allow seasonal hiring. The farmers want to remove this limitation.